Battery storage, a relatively new technology to the market. The storage market has come on leaps and bounds in the past few years, however many domestic homeowners are still wary of incorporating batteries into their renewables system. Batteries can be installed on the AC or DC side of a properties electricity. Although batteries store electricity in DC, some units have the technology incorporated in them to work only on the AC side, a key example of this is the PowerFlow Sundial, this has the inverters and batteries all in one intricately designed unit. Surplus energy (when generation is greater than demand) generated from a renewables system, this is often solar in the U.K. domestic and commercial markets, is harvested and stored in batteries. When the demand is greater than the generation this energy is exported from the batteries to offset any import from the national grid. There are several different battery technologies available, some of the key ones are lead acid, AGM & Gel, Salt Water, and lithium batteries; of which there are several types. Each battery chemistry has different uses and conditions under which it works best, for example, in the U.K. we often use Lithium Ion batteries for storing surplus solar energy, whereas in Ghana, Africa, we often use Gel/ AGM batteries. In the past few years battery storage has become increasing popular. This is partly down to the renewables industry pushing for a self-consumption mind-set. Faced with growing market uncertainty and cuts to incentives such as the Feed-In-Tariff a new angle was needed to encourage renewables deployment. Until recently battery storage wasn’t widely available or used, often they were only used in off-grid systems, and even then it wasn’t uncommon to find re-purposed forklift batteries being used for storage! With a huge increase in new technologies, and developments in the way storage could be used , the renewables industry saw the opportunity to push storage out to the masses. Self-consumption of generated energy is key to the industries survival. With the FIT due to end at the end of March 2019 there needs to be a way of renewable energy generators to use every drop of energy they produce. This way payback periods can be kept as low as possible. As the storage market increased, prices have dropped, much the same as when solar boomed in 2010/ 2011. These prices have dropped much quicker than many people expected causing a boom in battery deployment. This has been aided by technological advancements in energy efficiency and smart/ home energy management systems. The period of 2016 to 2017 saw a 50% increase in storage capacity in the UK with around 400MWh of storage installed in 2016 versus 600MWh in 2017. Current battery storage at the domestic level. Systems like the Sundial come as modular units, easy to install with everything in one box, and easy to expand simply by daisy chaining units together. Other batteries like the Pylontech batteries are also modular but need a control system and inverter to go with them, such as the GoodWe Hybrid or SolaX. New batteries are coming onto the market all the time, such as the SolaX Triple Power battery coming in 2019. When it comes to storage size matters! There are larger battery systems on the market that come as a well presented unit, such as the Tesla Powerwall2, this has a usable capacity of 13.5kWh. Tesla pride themselves on being a household name, delivering premium products. But how usable is 13.5kWh? In order to fully charge the battery, critical for keeping the battery media in good condition, a reasonable sized renewables install would be needed (although buying power from the grid to charge the battery is available on this unit). Our calculations estimate that in order to charge 13.5kWh of storage you would need around 12.7kW of solar PV*, the average domestic installation is around 4kW. Many of the installs we quote & design have the storage capability tailored to the solar PV array size and the property owners general electricity usage. Smaller storage of around 2.4kWh to 7.2kWh is ideal for most domestic properties; this is usually coupled with solar PV of around 4kWp this creates a happy medium between generation, storage, and export, whilst keeping costs relatively low. Depending on the inverter currently installed with an existing array, a 4.8kWh storage system could be added for between £2500 – £2800, around £3200 if a new hybrid inverter was needed alongside the system. Payback periods for this are reasonable, and for early adopters of solar who are on a higher FIT rate these payback periods can be a matter of only a few years. There are several benefits to having battery storage installed. Firstly you get to store the energy you produce. 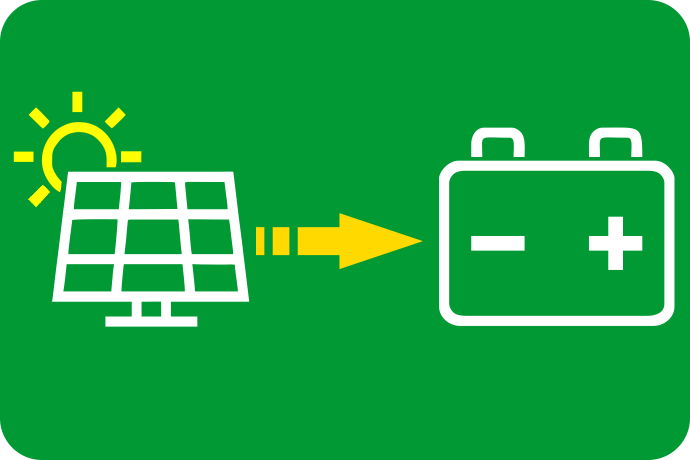 Batteries don’t affect your Feed In Tariff payments so why not store it all! Any surplus energy your solar generates can be sold back to the grid**, this is usually at a lower rate than at which it is sold. Example; You supplier can buy exported electricity from you at 5.24 p/kWh, you would then have to buy that electricity back again at a price of 12.82 p/kWh***, this mean you could save 7.58 p/kWh by storing that energy. Over time this can lead to savings on your electricity bill, especially if energy prices rise in the future. With some battery systems, we are able to set them up in such a way that should there be a grid failure your lights, and some other selected circuits can be run off of your batteries, this is known as EPS emergency power system. This kind of set up can be quite complex and is strictly regulated for safety reasons, thankfully some of the equipment we supply has this built in as standard. The Future of battery storage in the U.K.
As technologies continue to develop and storage becomes increasingly affordable the sector looks forward to an “explosive growth”. Industry experts predict that the sector could see more than 9000MWh of storage deployed over the next 5 years. Lauren Cook from Solar Media’s Market Research Division has found that in just 12 months the U.K.’s pipeline for new storage projects has grown by more than 240%, this is forecast to rise by at least 200% year on year [read the article here]. The way battery storage is used could also see revolutionary changes. 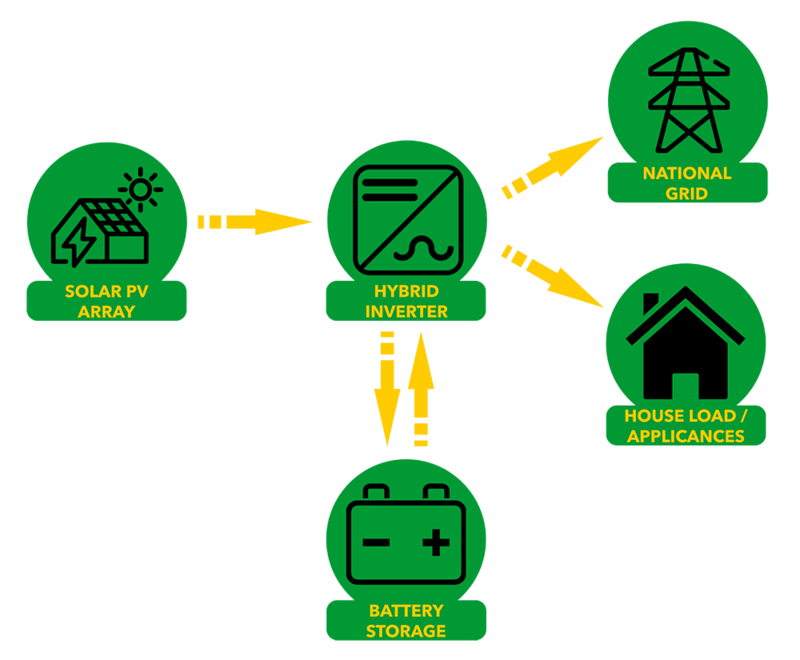 As we move towards a ‘smart grid’, domestic level storage could be used to offset peaks in demand within the national grid. Effectively batteries installed in homes and businesses would be used to power the national grid at times of high demand, with the owner getting paid for the energy they provide. Although this may seem like a long way off it is a scheme that is rapidly gathering pace, particularly with the increase in electric vehicles which also hold a storage capability. There are already battery systems on the market that are pure storage with no requirement for renewables, these often make use of the Economy Seven variable rate billing, charging at times when electricity is cheapest and able to export into a property to offset usage when the rates are higher. If you would like to know more about having battery storage installed, either with solar, or as a retrofit solution to an existing system get in touch. *Calculations based on the worst month figures in the UK using 285W modules. Based on one full charge per day. ** If you are on a deemed export agreement, you will continue to get 50% production payments, if you have a smart meter you will only get paid for what you export to the grid, batteries may affect these payments. *** Average prices based on information from Ofgem and UKpower.